4. Joseph Lacasse. He was the son of 8. Jean Baptiste LACASSE and 9. Marie Josette COUTURE. He married 5. Marie Sarah Lucia Bolduc February 02, 1858 in St. Claire, Quebec. 5. Marie Sarah Lucia Bolduc. She was the daughter of 10. Antoine BOLDUC and 11. Marguerite SANSGAGIERE. By way of interest, Joseph married twice, the second time to Marie Couture on 1 may 1876.
i. Joseph Henri Lacasce, born December 1858 in Canada; died 1919 in Skowhegan, Somerset County, Maine; married Etta Anna PIERCE November 13, 1882 in Madison, Somerset, Maine, United States. iii. Mary LACASSE, married Rene SIROIS. 2 iv. John Lacasse, born May 18, 1861 in Cranborn, Quebec; died January 31, 1936 in Skowhegan, Somerset, Maine, United States; married Delina Lilla Boivin 1890 in Skowhegan, Somerset, Maine, United States. v. Philippe Lacasse, born November 14, 1863; died February 15, 1948 in Evergreen Cemetary, Solon, Maine; married Leola Marcia BROWN 1898.
vi. Sarah Mathilde Lacasse, born 1864; died May 27, 1905 in Skowhegan, Somerset, Maine, United States. ii. Mary Lacasse, married Unknown Sirois. 6. 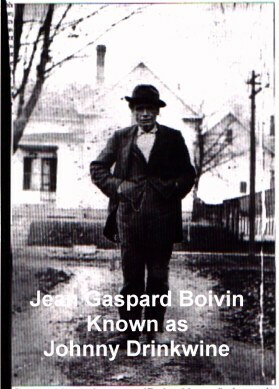 Jean (Gaspard) Boivin, born abt. 1829 in St. Marie, Quebec; died 1902 in Skowhegan, Somerset, Maine. He was the son of 12. Elphage Boivin. He married 7. Henriette Morin in Brewer, Maine, United States. 7. Henriette Morin, born Bet. 1836 - 1840 in Canada; died February 20, 1886 in skowhegan, Somerset County, Maine. Went by the name of Johnny Drinkwine, At the age of 13 he walked to Quebec and Shipped out on a fishing schooner bound for the banks of New Foundland, For 12 years he fished off Canadian coast, until at the age of 25 he came to the Brewer area (census shows Orono 1850) and sailed out of Bangor for 4 years. At the age of 29 he moved to Skowhegan and lived there until he died at the age of 73. May have also gone by the name Ethel Murray or Harriet Marrow. Possibly Native American(Canadian born). i. Charles Chasse, born Abt. 1854 in Maine; died July 12, 1900 in skowhegan, Somerset County, Maine; Stepchild; married Emma Rose Delima Lashon or Lachance March 12, 1881 in Notre Dame de Lourdes Skowhegan Maine. ii. John Jr. Boivin, born Abt. 1858 in Maine; died Bef. 1880 in Skowhegan,Maine, United States. iii. Peter Boivin, born Bet. 1858 - 1861 in Maine; died February 06, 1887 in skowhegan, Somerset County, Maine; (may be a Stepchild). iv. Joseph Boivin, born Abt. 1864 in Canada; died February 14, 1887 in skowhegan, Somerset County, Maine. v. Mary Boivin, born Abt. 1865; died March 15, 1886 in skowhegan, Somerset County, Maine. vi. Lena Boivin, born Abt. 1868; died September 18, 1886 in skowhegan, Somerset County, Maine. 3 vii. Delina Lilla Boivin, born October 07, 1869 in Skowhegan, Somerset, Maine, United States; died November 05, 1953 in Skowhegan, Somerset, Maine, United States; married John Lacasse 1890 in Skowhegan, Somerset, Maine, United States.